In many instances, it is not cost effective to rebuild a barrel. Purchase of a new barrel would be the best option. However, if cost becomes a consideration, barrels can be honed (machining the internal bore and polishing) to a minimum clean up. Honing allows the barrel to be used for a longer duration with the same consistency as a new barrel. However, once a barrel is honed to a new internal dimension, the corresponding screw must be rebuilt to match the new honed barrel size. In most cases, the corresponding screw would be worn and also in need of rebuilding. When completed, the matched honed barrel and rebuilt screw will have the same factory tolerances as new, with the benefit of like new performance, and the cost savings of rebuilt over new. Our screw rebuilding capabilities range from 2" (50mm) up to 3 1/2" (90mm) in size. We typically use a Colmanoy 56 hardfacing weld in most rebuilding applications. 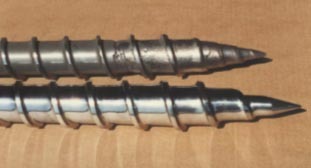 The rebuilding process can be finalized by hard chrome plating or nitriding the surface of the screw being rebuilt to bring it back to original factory specifications.